Roy Eisele was born to John Matthew Eisele and Elsie (Knorr) on April 10, 1923. According to the 1930 U.S. Census, Roy had a big family. In addition to his parents, he lived with older siblings, Florence, Ewald and Anamarie and one younger sibling, John. Roy’s maternal grandfather, August Knorr, also lived in the household too. The census also indicates that Roy’s parents immigrated to the United States. John Eisele was born in Germany, along with his paternal grandparents. Elsie was born in Russia but her parents were also born in Germany. The native language that was spoken in their California household was also German. Roy's father owned his own tailor shop. Roy Eisele completed all four years of high school, which is likely why he was quickly promoted to an officer after enlistment. He also worked as a sales clerk prior to joining the military. While Eisele’s enlistment record indicates that he was single without dependents in 1942, a wedding announcement was made in the Los Angeles Times in 1943 stating that he married Beatrice May Cramer. They were married in Texas, likely where he was stationed. Roy had a son, Roy, in March 1944. It is highly unlikely that Roy ever met or held his son, since he would have already been in Europe at that time. As a coastal state, California played a large role in shipbuilding for the war. Kaiser Steel Company was pivotal in the shipbuilding industry in southern California. California also had a booming agricultural industry. Unemployment was virtually nonexistent since so many new shipbuilding and agricultural industries and other wartime industries were producing on an unprecedented scale. Even though women entered the workforce in mass numbers, there was still a labor shortage. As a result, the country signed a guest worker program with Mexico, known as the Bracero Program. This converging of cultures created tensions between local servicemen and the Mexican laborers in Los Angeles. Due to the economic success of the state there was continued urban growth took place in the Los Angeles area, throughout the 1930s and 1940s. California's desert climates were converted into bomb practice grounds and numerous bases and airfields were constructed. Because of California’s diverse climate and vegetation, the state saw an influx of servicemen stationed there for basic training. The factories in California produced nearly 17% of the military supplies needed for the war. California also participated in food rationing, buying of war bonds, recycle drives, and even blood donation drives. Once Eisele completed his basic training, he and the 303rd Bomb Group (Heavy) were stationed in Molesworth, England. 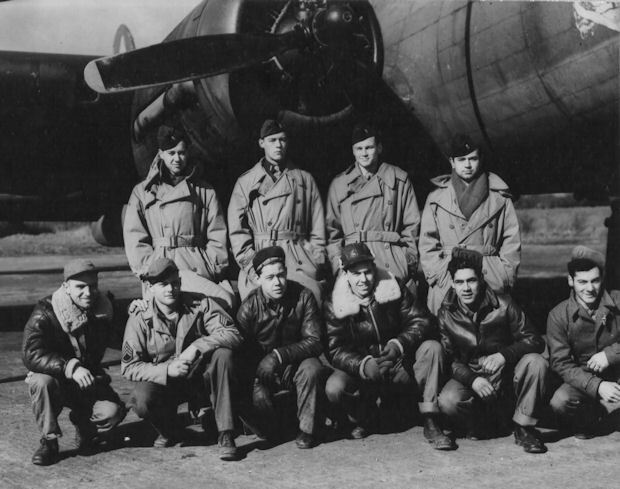 Flying B-17 heavy bombers, he and his flight crew joined bombed targets in France, Belgium, Netherlands, and Germany. In total, Eisele flew 37 missions. While seven ended in low fuel, engine failure, low oil, or crash landings, he had 30 credited missions from March 8 to June 12, 1944. As ground troops prepared for the amphibious invasion on D-Day, Eisele and his crew took part in Combat Mission #171 on June 5, 1944 in effort to reduce any German stronghold within the Cotentin Peninsula, the site of the Normandy Invasion. Taking a total of five hours and 20 minutes to complete, the bomb group was given the mission to destroy gun emplacements in Azeville, Lessay, and Caen, France. Because it was critical to secure the port at Cherbourg, securing the entire Cotentin Peninsula was vital to the success of the Invasion. On D-Day, June 6, 1944, Eisele flew in the third mission of the day (Combat Mission #174) and likely observed the Invasion in progress from the skies above. Many mission reports from personnel in his flight group “reported seeing barges, destroyers and battleships on the Channel and flashes of the firefight below lit up the clouds in the surrounding area.” For this mission, Eisele's target was Vire, France, which was another pivotal location to cut off the Cotentin Peninsula and cut German reinforcements off from the Normandy coast. Vire was also along the main route to Caen, a major German strong point in the Sword Beach landing zone. Eisele's final mission occurred on D-Day +6, Combat Mission #178. 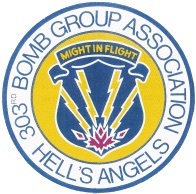 The 303rd Bomb Group (Heavy) was given the task to bomb and destroy an airdrome in the Cambrai/Epinoy, France region. Flying his B-17, #42-107048 (Tangerine), Eisele’s plane was “hit by flak between the No. 2 engine and fuselage, approximately one minute before ‘bombs away.’"
Another flak burst hit directly in the bomb bay and the entire B-17 burst into flames. Two pilots in Eisele’s squadron reported not seeing any parachutes, but one did. 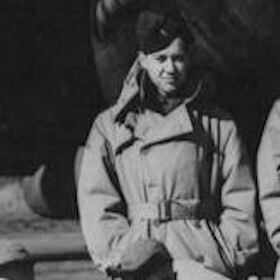 Tail Gunner, Staff Sergeant Edward J. Vallee escaped the plane and became a Prisoner of War, becoming the lone survivor of the crew. After igniting, the B-17 reportedly took a sharp nose dive, broke in half near the bomb bay door, and lost its left wing before crashing near Cambrai, France. As of today, a memorial bench honoring the Eisele Crew can be found in Cambrai. Eisele was awarded the Distinguished Flying Cross and Three Oak Leaf Clusters for his service. For me, June 12, 1944 is a memorable day. June 12, was the day that the 350th Bomb Squadron of the 303rd Bomb Group (Heavy) conducted a mission containing various targets in France in which First Lieutenant Roy Eisele lost his life when his plane was hit by flak. In the ultimate scope of the war his death seems insignificant, however we must honor the life, and the death of this heroic man. Roy was born on April 10, 1923 to John Matthew and Elsie Eisele. He was one of five, having two older sisters, Florence and Anamarie, an older brother, Ewald, and younger brother John. When the war started, it was doubtless to say that he did not want to leave his family, but this was not the only monumental choice he had to make. Roy most likely would have qualified to fight in the German military, being of German descent. In the end, he decided to leave and fight for the country he was born in and loved. Throughout his military service, Eisele received the Distinguished Flying Cross and an Air Medal with Three Oak Leaf Clusters. I never had the honor of meeting Roy Eisele, but I feel as though I have met him in spirit. It is hard to fathom this kind of connection that a person can have regarding someone who died so long ago. But he lived, he existed, and will always be there as a warmth within my heart. Being in the Normandy American Cemetery felt like a dream to someone like me; I had spent numerous months researching the events of World War II, overcoming roadblocks in order to find out any ounce of information on my Silent Hero, Roy. The anticipation was almost unbearable. The cemetery was green and silent. It overlooks Omaha Beach, an extraordinarily beautiful sight. The graves of the soldiers are all perfectly aligned and when looking at a diagonal, they seem endless. Standing at Roy's grave was unlike anything I have ever experienced. It is eerie to think that his body lay beneath my feet. It is hard to explain what it feels like to give the eulogy to a soldier who died during the Normandy campaign, so long ago. I felt a mixture of intense pride, sorrow, and joy - for I was there to honor him. I am forever grateful for the sacrifice that Eisele and his men made on that fateful day and to all soldiers who died to secure my freedom. In the years since the 2013 experience, Ms. Andersen and I have unearthed more details about the man we now share. His story has forever changed how we view the world and the WWII era. There isn’t a day that goes by where we don’t think of Roy. We speak of him as if he were our friend, a loved one. His courage and sacrifice is inspiring and we hope to share his story, so that he lived on through us. Databases at https://aad.archives.gov/aad/, 13 July 2013]. "Roy Eisele." American Battle Monuments Commission: Burials and Memorials. January 18, 2013. .
Roy Eisele. U.S., Headstone and Interment Records for U.S. Military Cemeteries on Foreign Soil, 1942-1949 [database on-line]. Provo, UT, USA: Ancestry.com Operations, Inc., 2014. Gobrecht, Harry D. “Mission Summaries of the 303rd Bomb Group” 8th Army Air Force Historical Society. Moncur, Gary L. "303rd Bomb Group (H) - Molesworth, England." 303rd Bomb Group (H) - Molesworth, England. N.p., 31 Jan. 1998. Web. 21 Mar.. 2013. Moncur, Gary. "Roy Eisele Crew." Roy Eisele Crew. N.p., n.d. Web. 14 Mar. 2013. 303th Bomb Group. 8th Air Force Historical Society, n.d. Web. 15 Apr. 2013. .